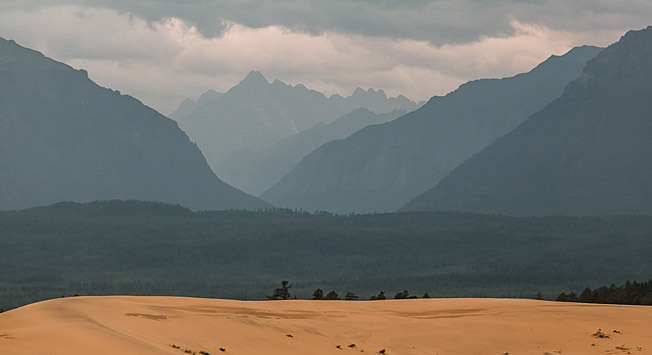 Here the golden sands of the desert sit side by side with the wilderness of the taiga and the peaks of mountain ranges: you can be bitten by mosquitoes on top of the highest peaks and encounter bears roaming the hot sands. The Chara Sands (also known as the Charsky desert) are located north of the Trans-Baikal region in the Kalarsky District (4912 kilometers from Moscow). This is the most inaccessible, but from a touristic point of view, the most interesting area in this part of Siberia. Its biggest advantage is that it is not as well known as the Baikal, Altay, Tuva and Khakasia regions, where sometimes foreign tourists are offered cheap grayling fishes instead of the prized “omul” and are shown pseudo-shamanistic rituals for ridiculous sums of money. It is wild and authentic here, offering much to those who love challenging and independent travel. The Chara Sands are located nine kilometers from the village of Chara in the heart of the Chara Lowlands, where snows never melt. The desert is 10 kilometers long and five kilometers wide. There are deserts in Asia that are larger and more accessible, but the word “unique” is not just a marketing tool here. Twentieth-century explorer Vladimir Preobrazhensky called this place “a region of geographical paradoxes” and he was right. The Chara Sands area is sharply interrupted by icy, rumbling swamps and wild taiga with larches and scrubs of birch trees. In addition to these taiga oases there is a lot of musk and many cones and mosquitoes, which abound everywhere in this desert. If you plunge deep into the middle of the desert, you’ll find dunes up to 100 meters high and 200 meters long and huge masses of soft sand that are very pleasant to walk on barefoot. From the dunes you can enjoy an amazing view of the huge and stormy Kodar mountain range, whose peaks are more often than not covered with snow. The Asian heat under your feet and the mountains and taiga of Siberia are the greatest reward for the traveler that dares to undertake such a challenging journey. The best seasons for exploring the Chara desert are late spring (in May) and summer. There are a few hypotheses on how such a significant expanse of sand appeared in the middle of Siberia. A popular one is that the desert took form about 100,000 years ago on the spot of an ancient lake when the Kodar range, which today can be seen from the dunes, was covered by a glacier. In time the global climate changed, the water supply was reduced and turned into a swamp, and finally erosion and wind finished the job. Some researchers argue that here one can find not the remains of southern steppe, but those of a northern and cold steppe-tundra: the homeland of mammoths. As in any other desert, there aren’t too many animals in the Chara Sands. At the beginning of the 20th century here one could still see an exotic (in a Siberian way) spectacle: The Evenki, a native Siberian group, would drive their herds of reindeer through the desert. Nowadays such migrations are practically nonexistent, but this does not lessen the exoticism of the Chara Sands. It is still possible to spot tracks left by foxes, roe deer, small rodents and even bears. Bears do not live in the desert, but they may cross it when searching for food. Last summer the expedition “Siberia and the dot” (a team of journalists, scientists and travelers, who go on expeditions all over Siberia and then write about their adventures on Siburbia.ru) were in the Chara Sands at the same time when there were wildfires that forced animals to leave the thick taiga and come closer to people. During one of these excursions the researchers found bear tracks just 300-400 meters from camp (a zoologist confirmed that the tracks belonged to a bear). Thus, visitors must observe elementary safety measures typical of places inhabited by bears: throw away all garbage, do not leave food in the camp (hang it on a tree, so that the bear will not sneak into the tent looking for it), and communicate your presence to the animal by making noise, talking loudly and shouting. Usually bears do not attack people. If they hear noise they are more likely to try to avoid any meeting with humans. Bear tracks in the Chara Sands are a rarity, and there have never been any cases of people being attacked by animals. Still, it is advisable to hang backpacks containing food, as even chipmunks are bold enough to sneak into tents. There is no water problem in the Chara Sands as there are two lakes here, the Alenka and Taezhnoe, located amid small woods. Travelers usually stop next to Alenka Lake, where there are shady and flat areas for camping and dry brushwood for lighting a fire. The climate here is volatile, so expect (and be ready for) weather changes and extreme conditions. The journey to the Chara Sands requires several stages. The first leg of the trip involves taking the Trans-Siberian Railway to Novaya Chara, the nearest village in the Transbaikal Region. From the train enjoy spectacular views of Lake Baikal; at Severobaikalsk station go for a swim as the train stops for about an hour. In Novaya Chara there is the Hotel Kodar and a regional museum that offers tourist maps (hotel contacts: +7(30261)75765; hotelkodar@yandex.ru). From there take a bus to the nearby village of Chara. There are also flights from Chita, but not on a regular basis. Further on, there are various options for trips to the Chara Sands. The safest and most comfortable way (and the one we recommend) is to join a tourist group led by an experienced guide at the Kalarsky visitor center, which organizes excursions to the sands and to Kodar in the summer: www.sdauria.ru. If you’re an inexperienced hiker, then it’s best to ask local drivers in Chara to give you a lift to the beginning of the Chara Sands on a Zil truck, because the path to the desert goes through the wide Middle Sakukan River, which can swell considerably in rainy periods when you’ll need the appropriate equipment and experience to wade through it. The visitor center can put you in contact with local drivers.